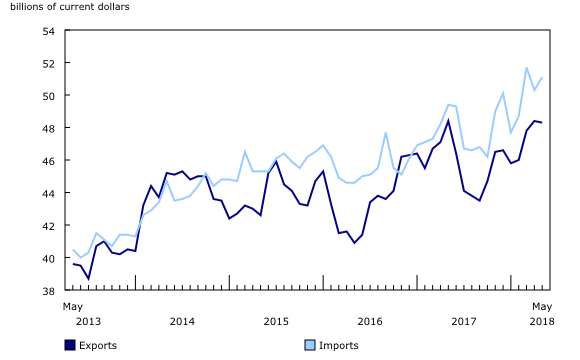 Canada's merchandise trade deficit with the world totalled $2.8 billion in May, widening from a $1.9 billion deficit in April. Imports rose 1.7%, mainly on higher imports of aircraft, while exports edged down 0.1%. Imports rose 1.7% in May to $51.1 billion, with 8 of 11 product sections increasing. Imports of aircraft and other transportation equipment as well as energy products contributed the most to the increase in May. Year over year, total imports were up 3.5%. Imports of aircraft and other transportation equipment and parts rose 17.7% to $2.4 billion in May, the fifth consecutive monthly increase for this product section. Aircraft drove the advance, more than tripling to $937 million on the import of several airliners from the United States. The value of aircraft imports from January to May was a record high for this period. Higher aircraft imports were partially offset by sharply lower imports of ships, locomotives, railway rolling stock and rapid transit equipment (-76.6%) in May. Imports of refined petroleum energy products, up 13.9% to $1.6 billion, also contributed to the overall increase in May, mainly due to higher imports of motor gasoline. A number of Canadian refineries were temporarily shut down in May, resulting in higher imports to meet domestic demand for refined petroleum products. For the refined petroleum energy products group, volumes rose 14.7% while prices fell 0.8%. Total exports edged down 0.1% to $48.3 billion in May, mainly due to lower exports of motor vehicles and parts as well as metal ores and non-metallic minerals. These declines were largely offset by higher exports of aircraft and other transportation equipment and parts, as well as forestry products and building and packaging materials. Year over year, total exports were essentially unchanged. Exports of motor vehicles and parts fell 3.6% to $7.3 billion in May, primarily due to lower exports of passenger cars and light trucks (-4.9%). A disruption in the supply of auto parts originating in the United States in May led to lower imports of motor vehicle engines and parts, contributing to the decline in exports of passenger cars and light trucks. Over the first five months of 2018, exports of passenger cars and light trucks were down 14.6% compared with the same period in 2017. Exports of metal ores and non-metallic minerals also fell significantly in May, down 14.6% to $1.3 billion, the lowest level since September 2016. Exports of iron ores and concentrates posted the sharpest decline, falling by more than half compared with the previous month. This decline coincided with work stoppages in iron mines in April and May. These declines were largely offset by higher exports of aircraft and other transportation equipment and parts, which were up 7.8% to $2.1 billion in May. Exports of boats and other personal transportation equipment almost quadrupled, mainly on the strength of higher exports of other transportation equipment to Saudi Arabia. Lower exports of aircraft (-15.2%) partially offset this gain, mainly on lower exports to France. Higher exports of forestry products and building and packaging materials also helped moderate the overall decrease in May, rising 3.1% to $4.1 billion, the highest level since January 2006. Exports of lumber, sawmill products and prefabricated finish carpentry (+9.8%) were responsible for the increase, primarily on higher exports to the United States. For this product group, volumes rose 6.3% and prices were up 3.3% in May. However, since January 2017, prices for this product have risen 24.1% while volumes have fallen 10.8%. Imports from countries other than the United States rose 2.9% in May to $18.5 billion. Higher imports from China (aircraft and other communications equipment), Belgium (pharmaceutical and medicinal products) and Germany were offset by lower imports from Mexico, among others. Exports to countries other than the United States edged up 0.2% in May to $12.5 billion. There were notable gains in exports to Saudi Arabia (other transportation equipment) and Hong Kong (unwrought gold). These increases were partially offset by lower exports to France and the Netherlands. Consequently, Canada's trade deficit with countries other than the United States widened from $5.6 billion in April to $6.1 billion in May. Imports from the United States rose 1.0% in May to $32.6 billion, while exports to the United States fell 0.2% to $35.9 billion. As a result, Canada's trade surplus with the United States narrowed from $3.7 billion in April to $3.3 billion in May. Comparing the average exchange rates of April and May, the Canadian dollar lost 0.8 US cents relative to the American dollar. In real (or in volume) terms, imports rose 1.2%, largely on higher aircraft imports. Real exports fell 1.0%, mainly due to lower exports of metal ores and non-metallic minerals. Revisions reflected initial estimates being updated with or replaced by administrative and survey data as they became available, as well as amendments made for late documentation of high-value transactions. 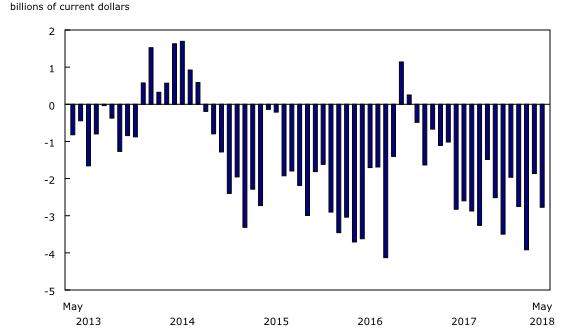 Exports in April, originally reported as $48.6 billion in last month's release, were revised to $48.4 billion in the current month's release. April imports, originally reported as $50.5 billion in last month's release, were revised to $50.3 billion. On June 1, 2018, the United States implemented additional tariffs on selected Canadian steel and aluminum products exported to the United States. The additional tariff rates are 25% and 10% respectively. According to Statistics Canada's international merchandise trade customs-based data, in 2017, the export value of aluminum products that are subject to the 10% rate was $9.2 billion; and the export value of steel products that are subject to the 25% rate was $7.2 billion. In response, on July 1, 2018, Canada imposed tariffs on the imports of certain products from the United States. These tariff rates are also at the 25% and 10% levels. The tariffs cover a diverse range of products and primarily fall under the categories of aluminum products; articles of iron and steel; prepared foodstuffs; paper products; machinery and electrical equipment; and other miscellaneous manufactured items. In 2017, the import value of US goods that may be subject to the proposed tariffs was $16.6 billion. Table 3 provides the Canadian International Merchandise Trade Import and Export Statistics for the items subject to the tariffs. Merchandise trade is one component of Canada's international balance of payments (BOP), which also includes trade in services, investment income, current transfers and capital and financial flows. International trade data by commodity are available on both a BOP and a customs basis. International trade data by country are available on a customs basis for all countries and on a BOP basis for Canada's 27 principal trading partners (PTPs). The list of PTPs is based on their annual share of total merchandise trade—imports and exports—with Canada in 2012. BOP data are derived from customs data by making adjustments for factors such as valuation, coverage, timing and residency. These adjustments are made to conform to the concepts and definitions of the Canadian System of National Accounts. For a conceptual analysis of BOP versus customs-based data, see "Balance of Payments trade in goods at Statistics Canada: Expanding geographic detail to 27 principal trading partners." For more information on these and other macroeconomic concepts, see the Methodological Guide: Canadian System of Macroeconomic Accounts (Catalogue number13-607-X) and User Guide: Canadian System of Macroeconomic Accounts (Catalogue number13-606-G). Data in this release are on a BOP basis and are seasonally adjusted. Unless otherwise stated, values are expressed in nominal terms, or current dollars. References to prices are based on aggregate Paasche (current-weighted) price indexes (2007=100). Volumes, or constant dollars, are calculated using the Laspeyres formula (2007=100). For information on seasonal adjustment, see Seasonally adjusted data – Frequently asked questions. In general, merchandise trade data are revised on an ongoing basis for each month of the current year. Current-year revisions are reflected in both the customs and BOP-based data. The previous year's customs data are revised with the release of the January and February reference months, and then on a quarterly basis. The previous two years of customs-based data are revised annually and revisions are released in February with the December reference month. The previous year's BOP-based data are revised with the release of the January, February, March and April reference months. To remain consistent with the Canadian System of Macroeconomic Accounts, revisions to BOP-based data for previous years are released annually in December with the October reference month. Factors influencing revisions include the late receipt of import and export documentation, incorrect information on customs forms, replacement of estimates produced for the energy section with actual figures, changes in classification of merchandise based on more current information, and changes to seasonal adjustment factors. For information on data revisions for crude oil and natural gas, see "Revisions to trade data for crude oil and natural gas." Revised data are available in the appropriate tables. Real-time table 12-10-0089-01 will be updated on July 16. Data on Canadian international merchandise trade for June will be released on August 3. Customs based data are now available in the Canadian International Merchandise Trade Database (Catalogue number65F0013X). The updated Canada and the World Statistics Hub (Catalogue number13-609-X) is available online. This product illustrates the nature and extent of Canada's economic and financial relationship with the world using interactive graphs and tables. This product provides easy access to information on trade, investment, employment and travel between Canada and a number of countries, including the United States, the United Kingdom, Mexico, China, Japan, Belgium, Italy, the Netherlands and Spain. To enquire about the concepts, methods or data quality of this release, contact Benoît Carrière (613-415-5305; benoit.carriere@canada.ca), International Accounts and Trade Division.